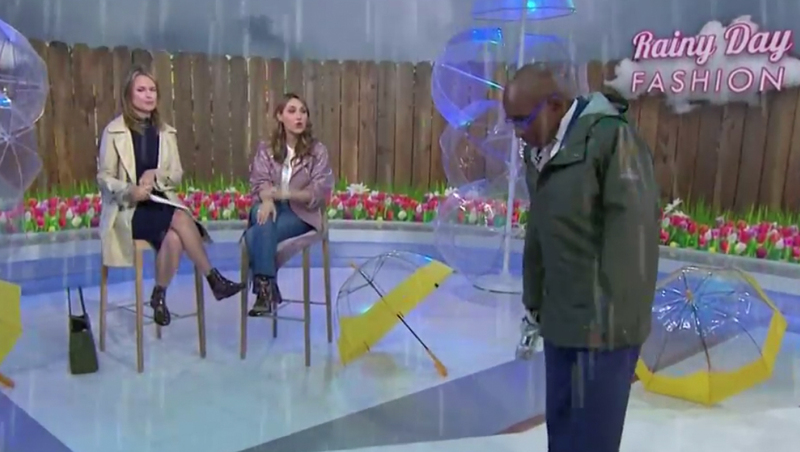 The segment, titled “rainy day fashions,” included weather forecaster Al Roker and meteorologist Dylan Dreyer along with other members of the “Today” family modeling a variety of rain gear, and also featured simulated rain and rain-themed set pieces. During the entire segment, the control room fed a “rain” effect overlay on top of the video feed, creating the illusion that it was “raining” in Studio 1A. Meanwhile, the “Today” team was shown sitting and standing among vertical poles with clear umbrellas “sprouting” from them while yellow rimmed umbrellas were placed around the floor. Studio 1A’s video wall, meanwhile, featured a fence and flower background along with a “rainy day fashion” logotype.